Reflecting on our achievements this last year, we would like to thank you, our generous supporters. You have provided moral support; social media likes and retweets generously; more than 40 of you have given us your time to help us save frogs; and even more have sacrificed your hard-earned money to help us achieve this important mission. Thank you! In particular I would like to recognize the extraordinary dedication and above-and-beyond service from our devoted conservation staff seen above proudly displaying the the captive-bred products of their hard work, including a second generation of captive-bred frogs. We salute you all. Toad Mountain harlequin frog (Atelopus certus): Juvenile Toad Mountain harlequin frogs sport metallic green chevrons and bright orange feet. The Toad Mountain harlequin frog is a pretty snazzy dresser; like other harlequin frogs, both males and females sport skin pigmented in bright, fanciful colors and patterns. However, males are much more likely to show off, gathering together by the stream-side year-round to boast their colors and call for mates. Female Toad Mountain harlequin frogs, on the other hand, only strut their stuff when they want to reproduce. On a recent expedition, Panama Amphibian Rescue and Conservation Project scientists found 50 males out and about and only 12 females, who came to the water to mate and lay eggs. Native to the Darién Province of Panama’s tropical forests, these endangered frogs’ populations are dwindling due to the rapid spread of chytrid fungus. The rescue project’s keepers at the Summit Zoo recently observed their Toad Mountain harlequin frogs in amplexus (from the latin “embrace,” amplexus is a form of pseudocopulation in which a male amphibian grasps a female with his front legs as part of the mating process), and a clutch of eggs soon followed! 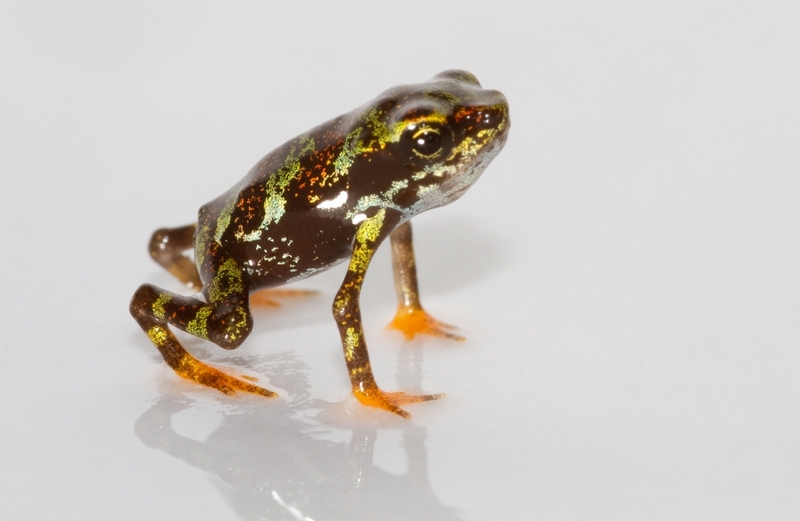 This is exciting news, especially because restoring Toad Mountain harlequin frog populations is one of the Panama Amphibian Rescue and Conservation Project’s top priorities. This success is vital for the understanding of their reproduction in captivity, which will make it possible one day to reintroduce this extremely rare species back into its native region. We are glad to give you the latest update on what is going on with our frogs here at the Panamanian Rescue and Conservation Project at the Summit Zoo in Panama. And we are going to start with some great news: After almost 100 days of a very long amplexus (from the latin “embrace,” amplexus is a form of pseudocopulation in which a male amphibian grasps a female with his front legs as part of the mating process), we have our very first Toad Mountain harlequin frog (Atelopus certus) clutch! This is huge news especially since A. certus is facing a very high risk of extinction in the wild and is classified as “endangered” by the IUCN Red List of Threatened Species. 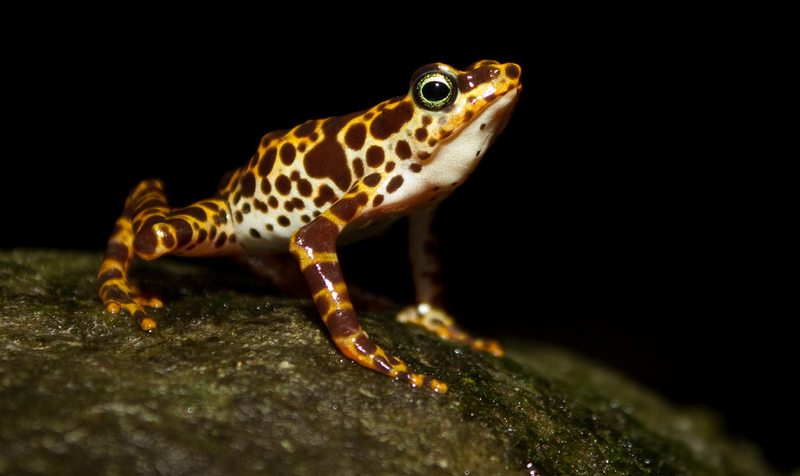 The Toad Mountain harlequin frog is an endemic species from the Darien region of eastern Panama and little is known about its reproductive and breeding behavior. From observations made here at the Summit Zoo in Panama, we have noticed some interesting behavior. 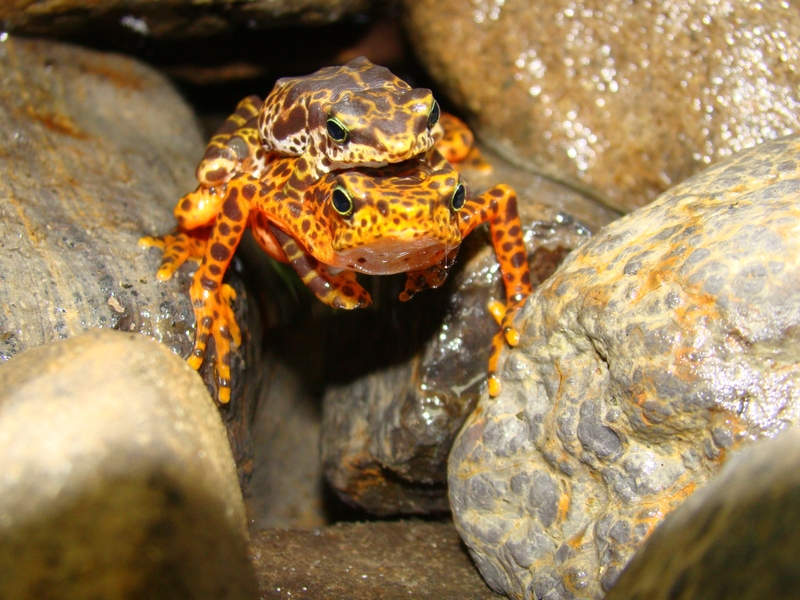 For example, during amplexus, the male A. certus holds on to the female so tight that he won’t eat for three months or more. We are taking notes and paying attention to the smallest change in water quality and temperature in their tank to assure the largest number of juveniles possible. The rest of the group is doing just fine. The La loma treefrog (Hyloscirtus colymba) tadpoles are growing and some have fully developed legs, though we still need to wait until they come out of the water and absorb the tail to place them in their new individual tanks. The baby Limosa harlequin frogs (Atelopus limosus) are bigger and stronger–they have been eating lots of springtails and we are making sure that UV light is always available to them to prevent any bone disease. The male adults are calling very often, especially early in the morning for our diurnal species, such as the Pirre harlequin frog (Atelopus glyphus). The rest of the harlequin frogs, H. colymba and our single male Bob’s robber frog (Craugastor punctariolus) call to attract their females throughout the night, particularly when is raining. We are also testing a few ways to feed the big C. punctariolus so we can offer them a variety of food as part of their diet. Thanks to our collaborators and volunteers for all their suggestions and new ideas. That’s all for now, but we will continue to keep you updated. Thanks for your support! Booo! Halloween’s over but ghost stories linger. In Panama, holiday season has begun! Nov. 3 marked the start of a long string of holidays–Independence from Colombia and from Spain this month, Mother’s Day, Chaunukah and Christmas in December, summer vacation for kids during the dry season, and ending up with Carnival festivities in February and back to school in March. 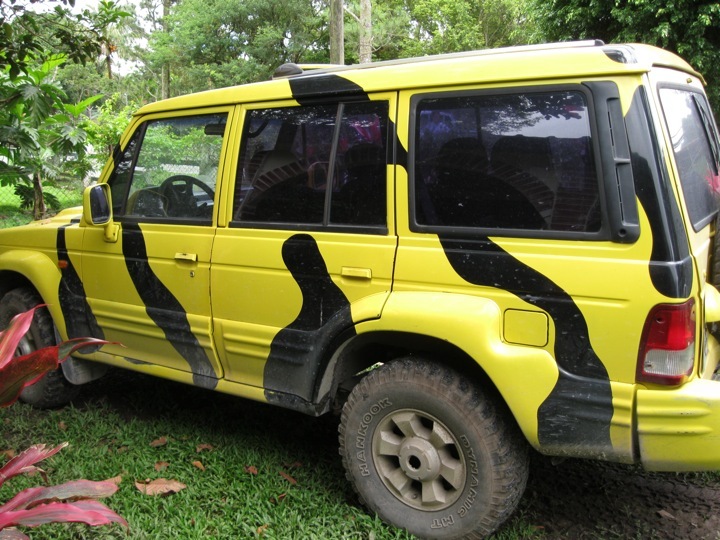 Yesterday my family piled into the car for the day-long drive up into the Chiriqui highlands near the border of Panama and Costa Rica. We slept very well last night in the cool mountains where it’s extremely quiet compared to our home on the border of Soberania National Park in the lowlands where they say that the night time forest sound reaches 50 decibels–and a big part of that sound comes from frogs. For some reason that no one understands, the chytrid fungus pathogen doesn’t seem to kill frogs in the lowlands, where it is sometimes found, but it decimates all amphibian populations along highland streams. Earlier this month I had the wonderful opportunity to take an interpretation course offered by the National Association for Interpretation as part of a USAID tourist guide training program organized by Panama’s Association for Sustainable Tourism (APTSO). Each of the student guides was asked to share a story that they tell visitors to Panama that touches their hearts. Carlos Fonseca, a young guide from Chiriqui, told that he and his brother used to spend summer days playing along streams in the highlands where they loved to find frogs…colorful frogs with pale white underbellies and even glass frogs that you can see through! About ten years ago, the chytrid epidemic passed through, and now the kids who play there don’t even know that there were frogs there. 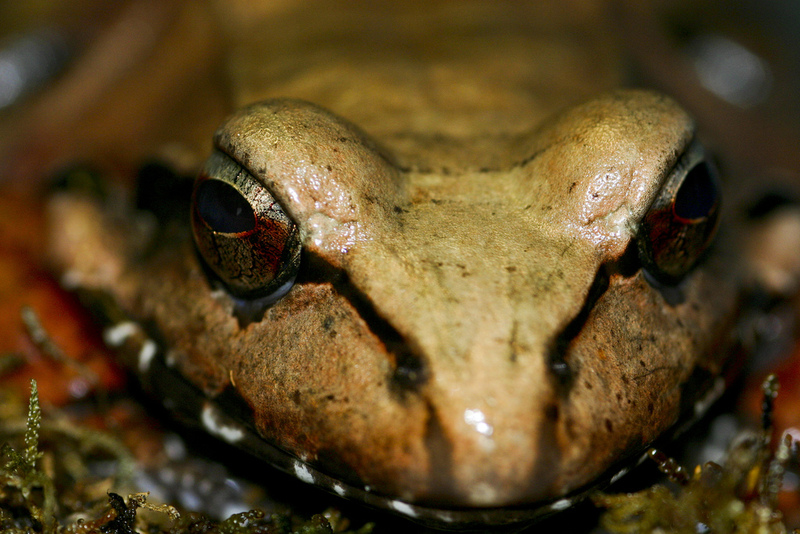 Insects and birds dominate a cloud forest soundscape that used to ping and croak. So, we’ll go for long walks in the woods on our weekend trip–we will see rainbows and maybe even a resplendant quetzal–and we’ll keep our eyes open for survivors–the few frogs that either managed to escape or were resistant to the disease. 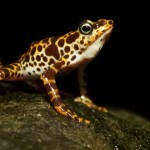 Due to the vision of researchers like Karen Lips, from the University of Maryland, who first saw the fungus coming into Panama from Costa Rica, Roberto Ibanez, from the Smithsonian Tropical Research Institute and Brian Gratwicke from the Smithsonian’s National Zoological Park, a rescue effort was mounted to save Panama’s frogs. 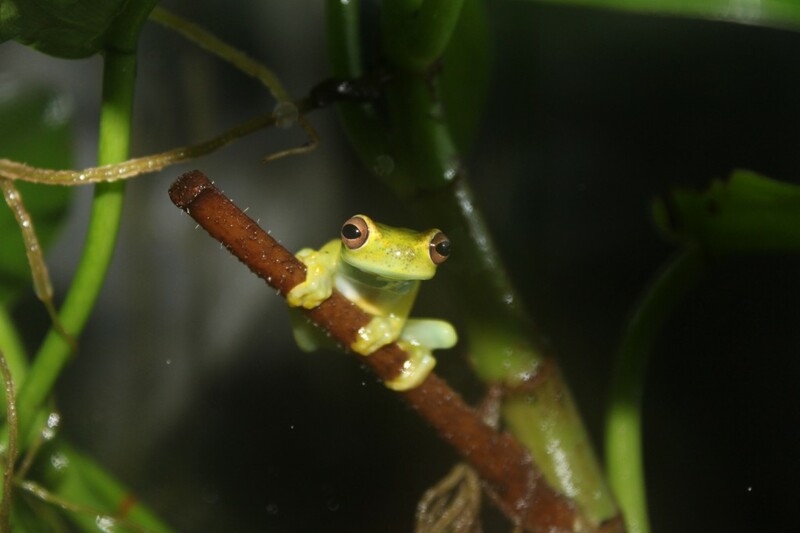 Now, with support from Panama’s Environmental Authority (ANAM) and Summit Nature Park in Panama and eight other partner institutions in the United States, the Panama Amphibian Rescue and Conservation project rescues frogs in Eastern Panama where the fungus hasn’t been yet. It is one of the few examples of proactive conservation of species that otherwise would be doomed, and, to that end, offers a kind of hope that is rare in this world. The five keepers for the rescue project at Summit Zoo (left to right): Nancy Fairchild, Rousmary Betancourt, Angie Estrada, Jorge Guerrel, Lanky Cheucarama. Our next door neighbors are: a margay cat named Derek, a couple of Geoffroy’s tamarins and an ocelot. Across the street lives a troop of white face capuchins and every day we pass the parrots as they try to hit on us and say “hola,” no matter how many times we ignore them. 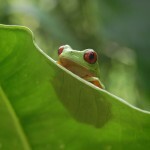 We are the keepers at the Panama Amphibian Rescue and Conservation Project at the Summit Municipal Park in Panama. 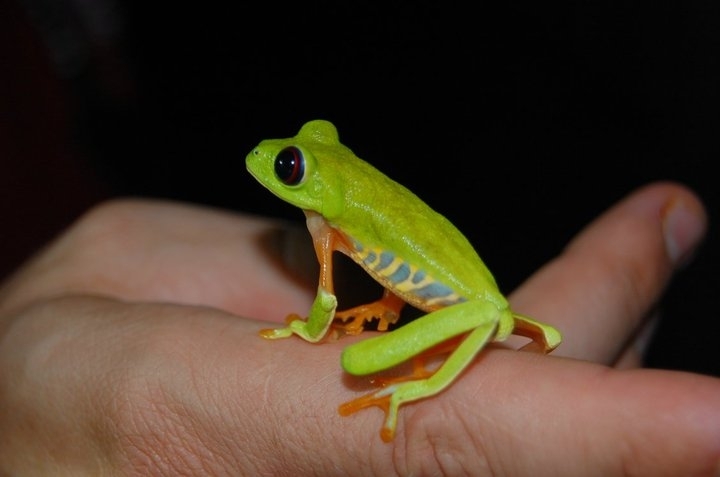 We take care of 191 frogs, from seven species, all of them native to Panama. Though each one of us has our own favorite frog—Kuno, Danielito, Chasky, James Bond and Survivor, for example—we make sure they all have everything they need to be happy and safe in their home at the zoo. Our frogs need a lot of attention! We have to keep them healthy, clean and fed. Maybe it doesn’t sound like that big of a deal, but each of those tasks takes a tremendous team effort, a high level of responsibility, tons of time and even a bit of intuition. To ensure healthy frogs, first we treat the animals for chytridiomicosis (a skin disease caused by Batrachochytrium dendrobatidis, or Bd) once they get back from rescue missions in the mountains of eastern Panama. Chytridiomicosis is a fungal skin disease that’s been killing amphibians in the wild for more than two decades and that is spreading fast. Treatment days are awful! We often get nervous and anxious because we know that for some of the frogs it’ll be too late, but we’re relieved at the same time when the majority of them survive. After they are treated, the new frogs are ready to be part of our collection. The hard part really comes after treatment. 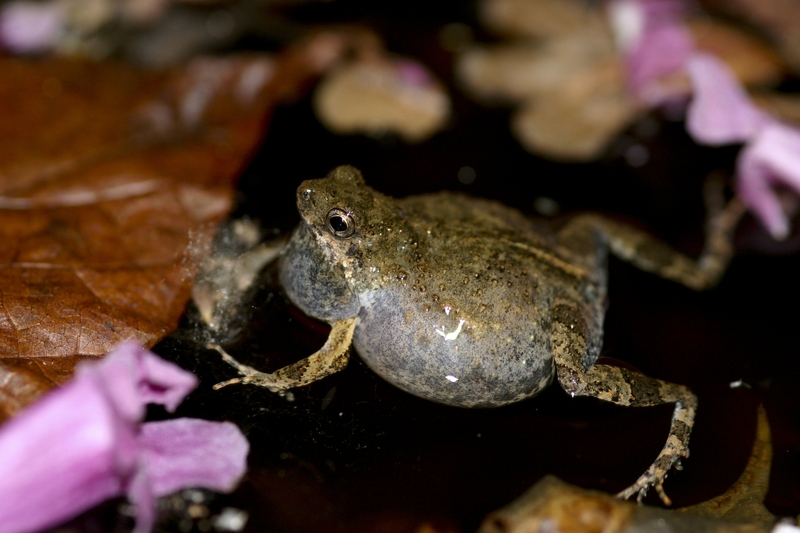 A chytrid-free frog does not automatically mean a healthy frog. 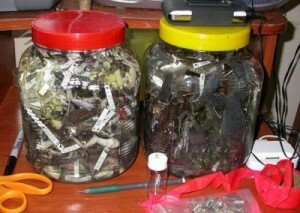 Before and after they become part of our collection, the frogs can be underweight or have parasites. It is part of our job to hand feed them if necessary and sometimes to remove very active worms under their skin. We need to make sure the frogs take their medicine on time, with the correct dose and with proper follow-up. None of this would be possible without the help and supervision of a group of vets and keepers from other conservation centers and zoos who trained us and are patient enough to receive a lot of emails and phone calls from us. Frogs don’t need to take a bath to stay clean, though their environment needs to be cleaned regularly. 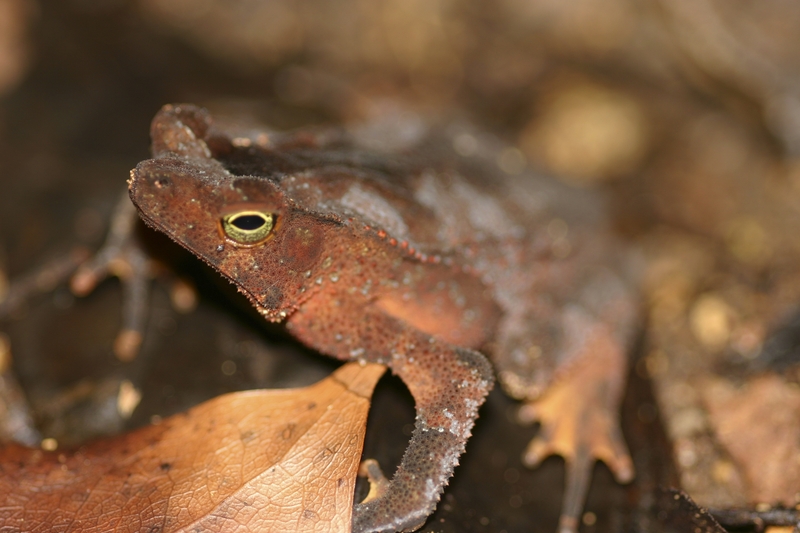 Amphibians are very sensitive to changes in their habitat because of their permeable skin and the fact that during metamorphosis, they spend part of their life stages in both ecosystems: aquatic and terrestrial. These are some of the reasons why they are declining so rapidly in the wild. 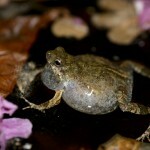 When permeable skin comes in contact with contaminated water or soil, frogs can get infected by Bd. 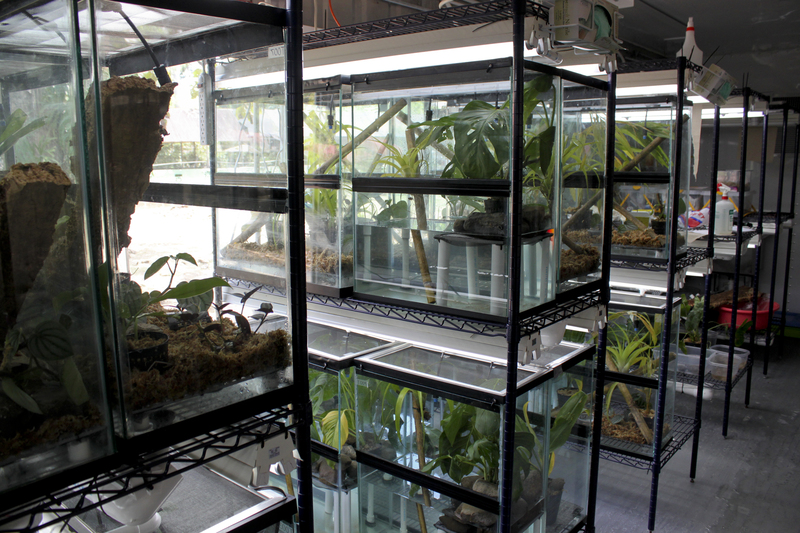 In our control environment in the pod, we need to clean the frogs’ enclosures, especially the ones in quarantine. We change and clean all the tanks twice a week, change and clean their plants and leaves, spray water on the tanks that don’t have misting systems and remove the feces. Last but not least: frogs need to eat! 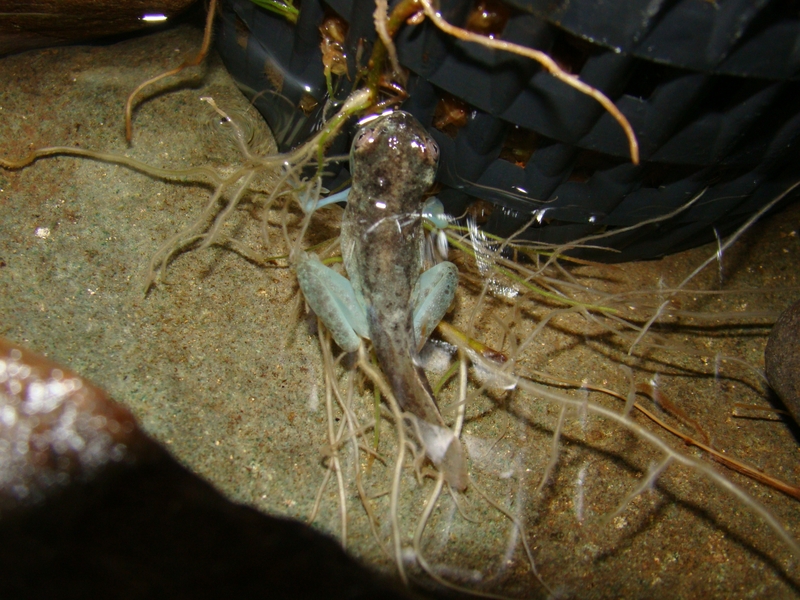 What do our frogs eat? 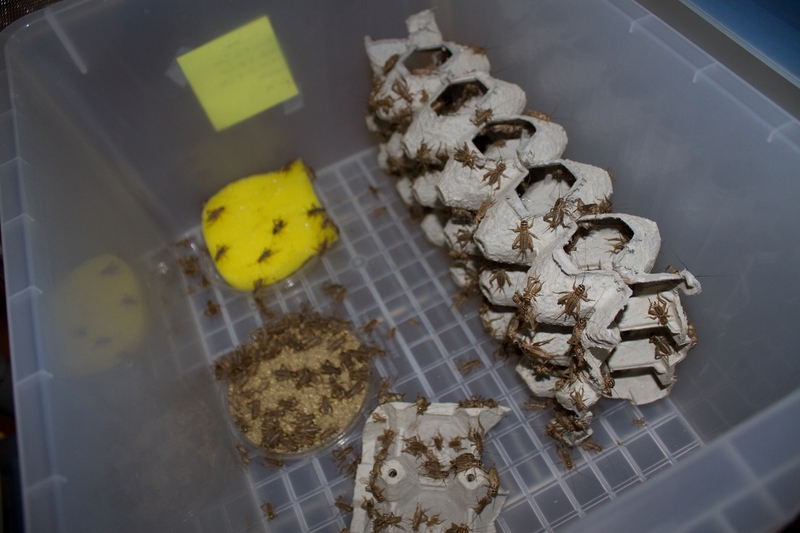 We would need many blog posts to fully explain how we manage to keep alive a room full of two species of fruit flies, springtails and earthworms; and an even larger room with 95 plastic boxes full of crickets and a couple containers of superworms. The latest additions to the menu are a working colony of cockroaches and a brand new outdoors house for grasshoppers. You can say that these frogs are well fed…maybe too well. They eat so much that we’re even putting a few of them on a diet this week! Frogs are clearly always on the minds of the rescue project's keepers at Summit Zoo. Did we mention that all of this is not enough to save the species? To do that, we need to breed them too. Reproduction is a very different story. We basically need to create the perfect scenario so the frogs can get in the mood. And getting them in the mood can take from two days (such as for the Toad Mountain harlequin frog, or Atelopus certus) or eight months (as is the case for La Loma leaf frogs, or Hyloscirtus colymba). This is part of our daily work; we love it and we are very proud of it. Though some people call us “frog heroes,” we are proud to be part of a group of scientists, keepers, vets, volunteers and frog lovers who are trying to safe these beautiful and interesting animals all over the world. 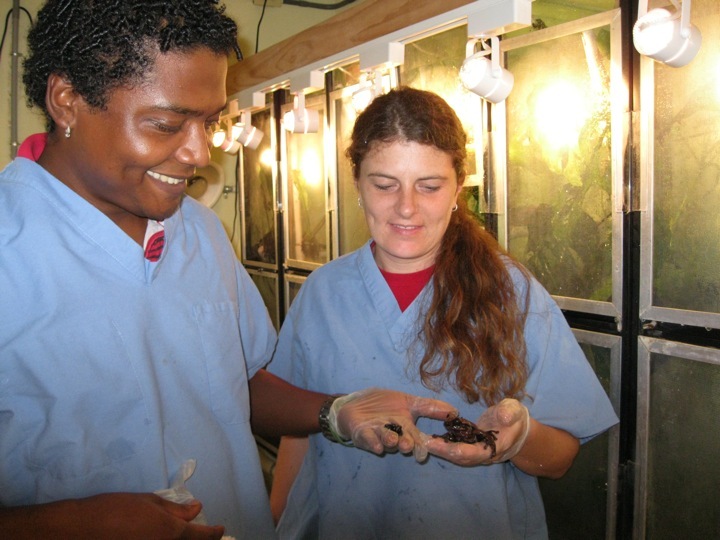 –Angie Estrada, Nancy Fairchild, Rousmary Bethancourt, Jorge Guerrel, Lanky Cheucarama, keepers for the Panama Amphibian Rescue and Conservation Project at the Summit Zoo in Panama. 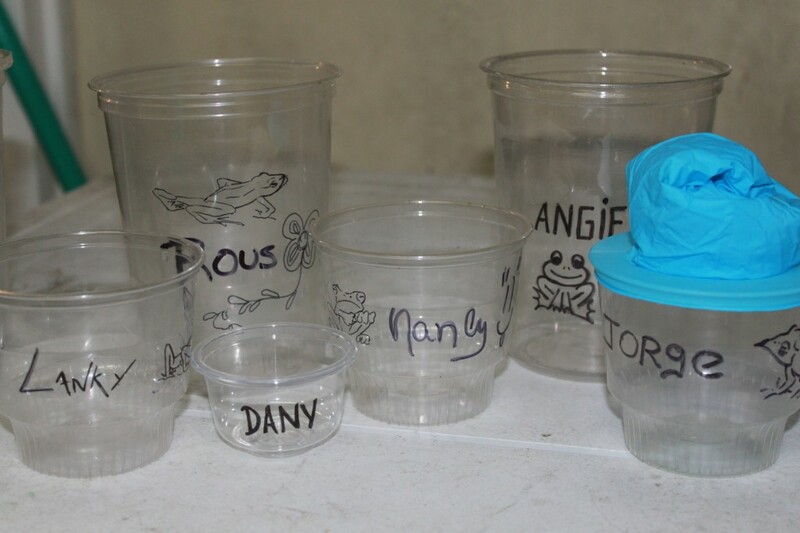 Los cuidadores del proyecto de rescate: Nancy Fairchild, Rousmary Betancour, Angie Estrada, Jorge Guerrel, Lanky Cheucarama. Nuestros vecinos de al lado son: un tigrillo llamado Derek, una pareja de monos tití y un ocelote. En frente viven una tropa de monos cariblancos y sin importar las veces que caminemos frente a los loros de cresta roja tenemos que ignorar sus flirteos y sus incesantes “hola”. Somos los cuidadores del Proyecto de Rescate y Conservación de Anfibios de Panamá en el Parque Municipal Summit en Panamá. 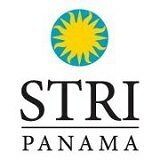 Nosotros cuidamos de 191 ranas, de siete especies diferentes, todas ellas nativas de Panamá. Y aunque cada uno de nosotros tiene su favorita-por ejemplo: Kuno, Danielito, Chasky, James Bond y Survivor-nos aseguramos que todas tengan todo lo que necesiten para ser felices en su hogar en el zoológico. ¡Nuestras ranas necesitan de mucha atención! Es nuestro deber mantenerlas saludables, limpias y alimentadas. Quizás no parezca algo muy complicado, pero cada una de esas tareas requiere de un tremendo trabajo en equipo, un alto nivel de responsabilidad, toneladas de tiempo e incluso un poco de intuición. Para asegurarnos que las ranas estén saludables, necesitamos primeramente tratar a los animales contra la quitridiomicosis (una enfermedad de la piel causad por Batrachochytrium dendrobatidis o también conocida como Bd) una vez regresan de las giras de rescate en las montañas del este de Panamá. La quitridiomicosis es una enfermedad infecciosa de la piel que ha causado el decline de poblaciones de anfibios por más de dos décadas y que se está dispersando demasiado rápido. ¡Los días de tratamiento son horribles! Muy a menudo nos sentimos ansiosos y nerviosos porque sabemos que para algunas ranas será demasiado tarde, pero al mismo tiempo nos sentimos aliviados al observar que la gran mayoría sobrevive. Después de ser tratadas, las ranas nuevas están listas para ser parte de nuestra colección. La parte mas difícil es realmente, después del tratamiento. Una rana libre de quitrido no es una rana saludable. Antes y después que formen parte de nuestra colección, las ranas pueden presentar bajo peso o tener parásitos. Y es parte de nuestro trabajo el brindarles alimentación asistida de ser necesario y algunas veces debemos remover activos gusanos que se encuentran debajo de su piel. Tenemos asegurarnos que las ranas tomen a tiempo sus medicamentos, que la dosis sea la correcta y que se le de el seguimiento apropiado. Nada de lo anterior seria posible sin la ayuda y supervisión de un grupo de veterinarios y cuidadores de otros centro de conservación y zoológicos quienes nos entrenan y están disponibles para recibir miles de emails y llamadas con cientos de preguntas. Las ranas no necesitan de un baño para estar limpias, sin embargo el ambiente donde se encuentran debe permanecer regularmente limpio. Los anfibios son muy sensibles a cambios en su ambiente debido a su piel permeable y al hecho que durante la metamorfosis, pasan parte de su ciclo de vida en ambos ecosistemas: acuáticos y terrestres. Estas son alguna de las razones por las cuales los anfibios están desapareciendo en la naturaleza. Cuando la piel permeable entra en contacto con cuerpos de agua o suelo contaminado, las ranas pueden infectarse de Bd. dentro De nuestro ambiente controlado en el laboratorio, es necesario mantener limpios los contenedores de las ranas, especialmente aquellos que se encuentran en el área de cuarentena. Dos veces por semana, nos encargamos de cambiar y limpiar todos los tanques y plantas dentro de los mismos, mantener húmedo su interior con la ayuda de un aspersor y eliminar las heces que se encuentran en ellos. Las ranas son un parte grande de las vidas de los cuidadores del proyecto de rescate. ¡Por último pero no menos importante: las ranas tienen que comer! ¿Que comen nuestras ranas? Serán necesarios muchos otros “blogs” para explicarles como logramos mantener un cuarto con de dos especies diferentes de moscas de frutas, cajas con cientos de mínimos colembolos y lombrices de tierra. Además de un cuatro aun más grande con 95 cajas repletas de grillos domésticos y varios envases con larvas de escarabajos. La última adición al menú de las ranas es una colonia de cucarachas y una nueva casa al aire libre lista para albergar deliciosos saltamontes. Se podría decir que estas ranas están bien alimentadas…demasiado bien tal vez. Comen tan bien, que algunas iniciaron una estricta dieta esta semana! ¿Les mencionamos que todo esto no es suficiente para salvar a una especie? Para lograrlo, también debemos reproducirlas en cautiverio. La reproducción es una historia muy diferente. Básicamente hay que crear el escenario perfecto para que las ranas entren en ambiente. Y para lograr que las ranas se sientan cómodas y estén listas para reproducirse, puede pasar desde 2 días (como en el caso de el sapito arlequín de montaña) hasta 8 meses (como en el caso de la rana hoja de la Loma o H. colymba). Todo esto es parte de nuestro trabajo diario; nos encanta y estamos muy orgullosos de ello. Aunque algunas personas nos han llamado “los héroes de las ranas” nos llena de orgullo formar parte de un grupo de científicos, cuidadores, veterinarios, voluntarios y amantes de las ranas quienes están haciendo un gran esfuerzo alrededor del mundo para salvar a estos hermosos e interesantes animales. Angie Estrada, Jorge Guerrel, Lanky Cheucarama, Nancy Fairchild y Rousmary Betancour, los cuidadores del Proyecto de Rescate y Conservación de Anfibios de Panamá en el Parque Municipal Summit en Panamá. 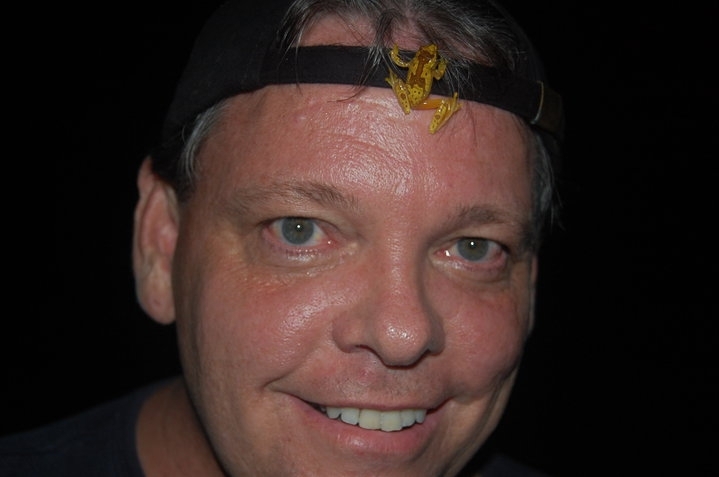 As a volunteer for the rescue project, Jeff Coulter helped both to care for frogs at Summit Zoo and to build the second rescue pod. Author Ralph Charell once said: “Nobody exceeds his or her wildest expectations unless he or she begins with some wild expectations.” I think that nicely sums up my recent trip to Panama as a volunteer with the Amphibian Rescue and Conservation project. To be candid, my expectations ranged from the mundane (constant cage cleaning) to the extravagant (finding a Panamanian golden frog in the wild). So by the time I got to Gamboa, I had no idea what to expect. To try to share everything that I experienced in my eight days as a volunteer would fill up a number of blog posts, so I will try to stick with the highlights. 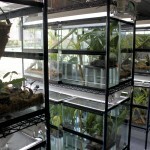 Building Frog Habitats: Sounds mundane and routine…is mundane and routine. And that’s how I thought about it at first. But the more I thought about it, the more inspired I became. Sure it’s not the most exciting work around, but just about the time I thought I would hate doing it, I realized that I hated the fact that it needed to be done even more. 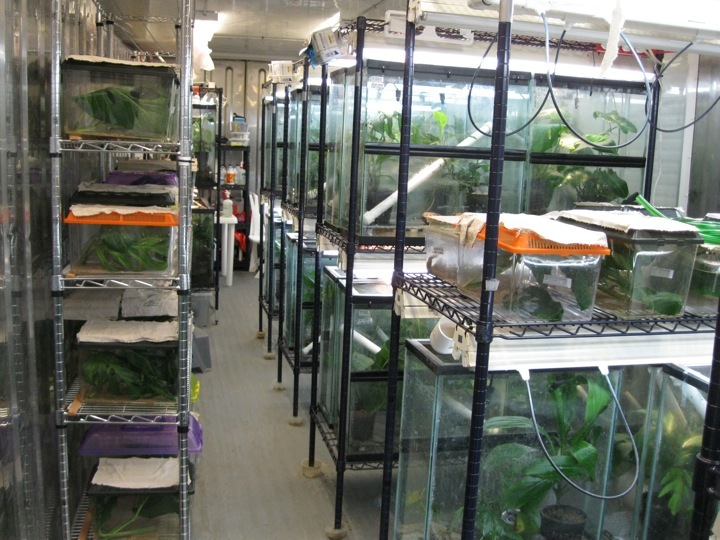 The project’s goal is to establish an amphibian ark where scientists can maintain healthy, genetically diverse populations of priority species. At one time Panama had more than two hundred species of frogs. Twenty-five of those have already gone extinct and as many as half of the rest are on the verge of extinction. If by hanging lights, and building cage bottoms I could play even a small role in helping keep a species from going extinct, I was more than willing to do whatever was necessary. Spot Checks: The project has a number of employees who really give from the heart, but there is so much to do each day! On a couple of occasions I was able to pitch in and help them get through the tasks at hand. Each day every frog is visually checked, his or her cage is cleaned, and on certain days vitamins and minerals are provided to keep the frog healthy. This is in addition to the days when all the greenery in the habitats is checked or replaced. The job sounded easy at first. Spot the frog, look it over, clean out the frog poop. Sounds simple right? Now factor in the fact that these frogs are great at hiding and jumping and it suddenly becomes a much more complicated task! It seemed like I usually used one hand for keeping the frog in the enclosure, one for cleaning and one on standby in case my first hand failed (which it did a couple of times). You never knew you had three hands until you are taking care of frogs! This red-eyed tree frog was among the frogs Jeff caught while volunteering in Panama. 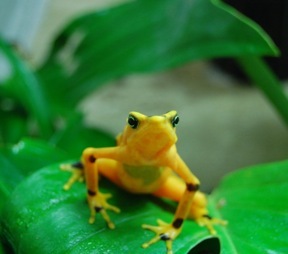 I am an interpreter in the Amazonia Exhibit at the Smithsonian’s National Zoo, so I have had the opportunity to learn a lot about frogs and enjoy talking to guests about them. There is a massive difference between pointing out frogs in a tank and chasing a one-inch frog through a marsh at night while your frogging team keeps yelling: “Don’t let it get away! Grab it, grab it!” It’s a whole new level of learning, let me tell you. It was an amazing opportunity to catch, photograph, learn about and release the frogs back into the wild. Along the way I learned more about their behaviors, calls and needs, which is all to the good. 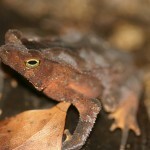 Not just about frogs: When I first filled out my volunteer application I was convinced I would not be selected. I didn’t really have any animal husbandry background and my Spanish skills were limited, at best. What I learned is that the project needs people with all sorts of different skills–and skill levels–and that all you really have to have is a love of frogs. But the trip wasn’t just about frogs. It was also about people and cultures and sharing, learning and laughing. One evening after we finished working I was invited to visit the village of one of the project staff. Lanky is a member of the Wounaan tribe, a group of indigenous people who live along the Rio Chagres and it was a great honor to meet his family and see the combination of traditional lifestyle and forward thinking that this family group embraces. Their thatched platform homes are very traditional, but use solar panels for lighting and electrical needs. 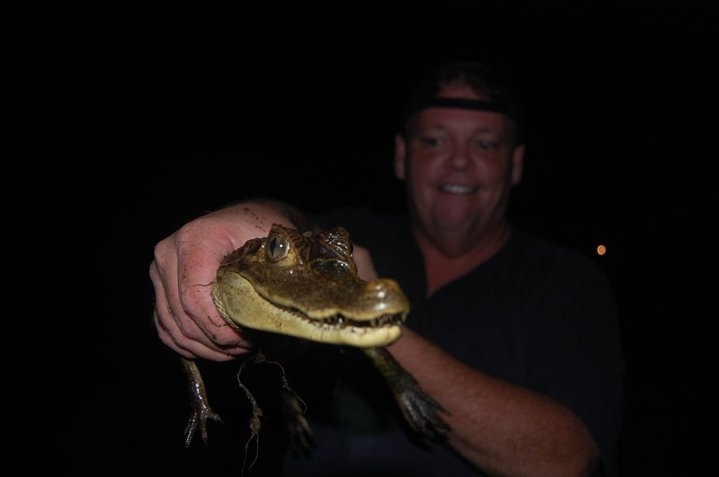 During a nightly frogging expedition, Jeff seized the opportunity to hold this caiman. All of the staff made me feel welcome and actively contributed to my somewhat improved Spanish. While we couldn’t always communicate in long sentences, we could always find a way to get our meaning across and a smile is a language unto itself! I also learned a lot about other types of animals that live in Panama. The project is located at the Summit Botanical Garden, which houses a large number of animals native to Panama. I was able to see harpy eagles (the national bird), tamarins, ocelots, monkeys, coatis and more. Our frogging adventures introduced me to all sorts of other animals. Would I recommend it? How could I not? The phrase “life-changing” may sound cliché, but in this case is perfectly accurate. It’s an opportunity to make a real difference in a fun, beautiful, exciting and sometimes challenging environment! —Jeff Coulter is a volunteer at Smithsonian’s National Zoo. 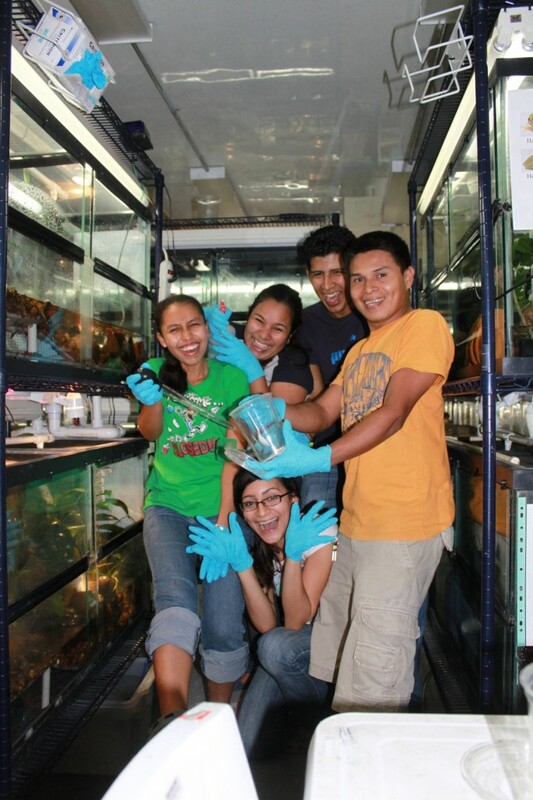 Interested in volunteering for the Panama Amphibian Rescue and Conservation Project? Apply now! 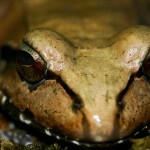 One of the ways to tell the frog's story is through photos that capture each animal's unique beauty in detail. 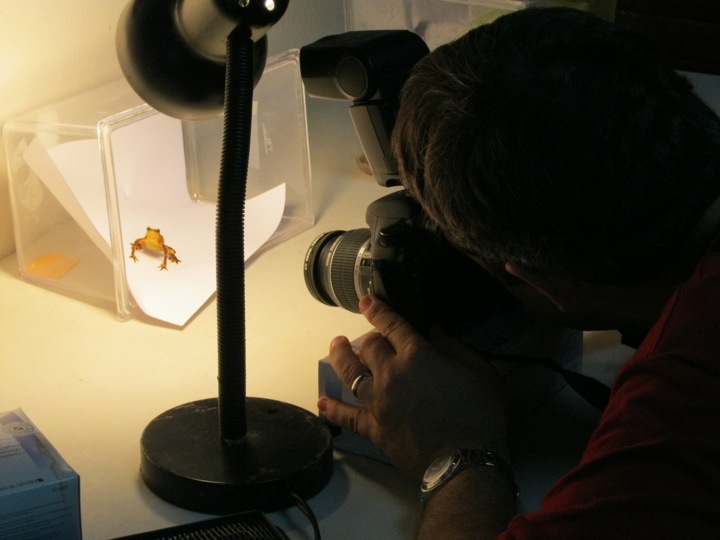 Here the project's international coordinator, Brian Gratwicke, takes one of his incredible stylized frog shots. Anyone who’s been out in the woods at night has heard the call of a frog. Sometimes it’s from a female to a nearby male looking for some romance. Sometimes it’s from a whole camp of males hoping to impress a very picky female. 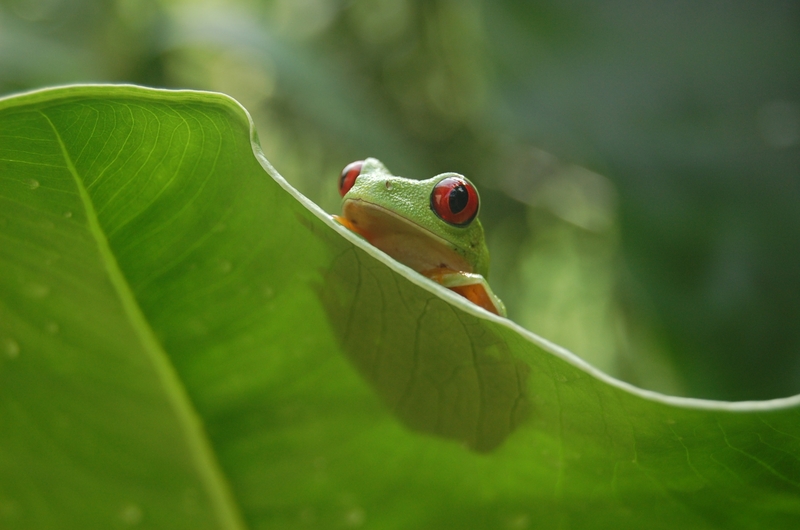 After just a few days in the Panamanian rainforest, I have learned to identify the call of the tungara frog (and can hear one out my window right now), the gladiator frog and the red-eyed tree frog. I’m still working on learning the many other big noises that come from these small creatures. Although the sounds that frogs make are as varied as the animals themselves, there’s one thing frogs can’t do: talk. That’s where I come in. Frogs have an important story to tell. It’s one about a fungus that is wiping out their kind worldwide and spreading rapidly. It’s one about those among the Earth’s most powerful species who are doing something to save the animals and it’s about those who don’t much care. Through the frogs’ eyes, it’s a story that has evolved along with the planet since the time of the dinosaurs and a story that still has a very uncertain ending. 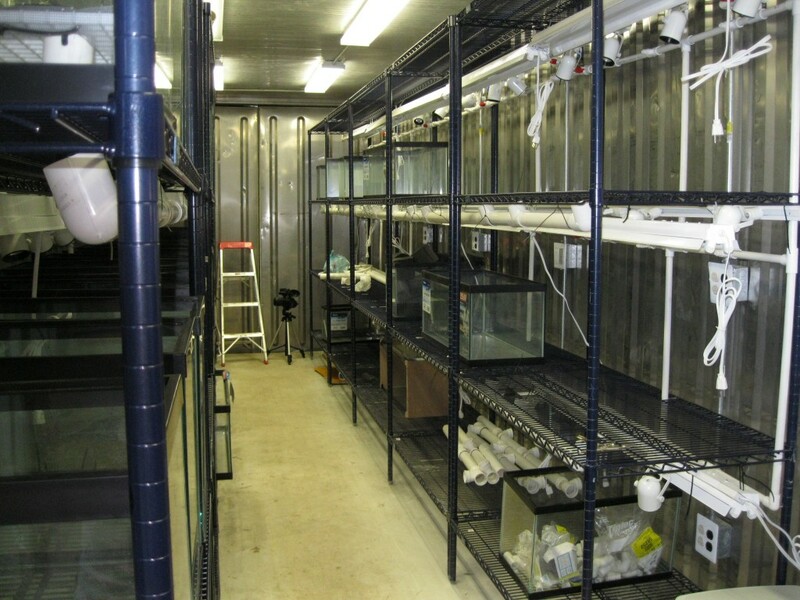 ...into a rescue pod like this, which already houses a number of frogs and is the pod I've worked in this week. The frogs at Summit Zoo were able to tell their story to a reporter who came to visit today and my job—the conservation action that I have to offer—is to ensure that reporters help get the word out and that we connect with as many people as possible in Panama, the States and, well, everywhere else. We need people to care and then we need people to take action. We need this to happen very quickly, before chytrid spreads to those places that are home to the rescue priority species we’re still trying to make room for. Right now we’re already pushing capacity with the newbie Pirre Mountain frogs (Atelopus glyphus) in quarantine, awaiting their turn to re-locate to a rescue pod. But their rescue pod still looks more like what it was originally created to be—a shipping container. Spreading the word requires the interest of reporters around the world. Ed Smith, a biologist at the National Zoo, helps a film crew work with Panamanian frogs at the Zoo's Amazonia Exhibit. Outfitting the pods for the frogs takes a tremendous amount of work. Once we receive the shipping industry’s donation, we need to turn it into an ark by setting up life support systems, from air conditioning to filtration to lighting. This week it took me two hours to make just three false bottoms (tank bottoms that prevent the frog from escaping through a filtration pipe) and about an hour to put together about 20 lights. Really we’re just doing this one or two people at a time. This takes time and this takes money. Thanks to a grant from the Smithsonian Women’s Committee, the rescue project was able to hire someone to coordinate and recruit volunteers—and volunteers are essential to building capacity we need. So my shameless plug in the midst of a week of being nothing but frog mad: If you want to be among the good guys in the story of the frogs, come to Panama to volunteer. Or donate money. Or help with the campaign we’ll be announcing next week. Or just do whatever you can to help us spread the word, whether on Facebook, Twitter or at your next dinner party. When the words stop, so, too, will the frog calls. And that’s a silence I don’t think the world can bear.